A feisty Mexican themed mobile slot that's crafted by Elk Studios. Let's check it out! It's been a while since we were treated to an absolutely astounding new slot and Elk Studios have come and thrown this bomb, or taco, shell on us. Taco Brothers is a slot that's got our mouths open wider than when we're trying to take a bite of a massively overfilled… taco. Alright, that's the end of bad taco puns, but let's go back to talking about this new mobile slot. It not only looks drop-dead gorgeous, has some stunning graphics, but offers plenty of financial incentives for you to check it out too. We've waited so long for a slot that totally blew us away and the day has finally come. Launched on the 9th of September, we should've known that Taco Brothers will be quite something. That's because developers Elk Studios have continuously put out some amazing games like Electric Sam and The Lab. Trying to tell us something? Consider this: Mexico, thiefs, underground tunnels to escape from prison, cheeky names…Doesn't all of this sound just too familiar to El Chapo, the notorious Mexican drug lord, who has managed to escape from prison twice now? Well alright, the storyline of Taco Brothers is somewhat more innocent, albeit very engaging. Thank God for Elk Studios – we salute you for developing a clear narrative line. For too long we've had to endure slot after slot with no plot. It even rhymes, that's how bad the slots, which are continuously being sold as ‘new launches' but have nothing going for them, are. Not so with Taco Brothers, because it's simply captivating. You can see through the transparent reels that the slot is set in 19th century Mexico, a small village in the year 1881 as the slot intro informs us. Life goes by peacefully every day until Captain Diaz, that devil, arrives and steals all the tacos and pesos from the villagers. Then, it is up to the three Taco Brothers, suitably named Pico, Pepe and Paso, to try and get the loot back. Aided by you of course. Five reels, 243 paylines, winning from left-to-right…All sounds pretty standard, doesn't it? But Taco Brothers has a really cool unique feature that we haven't seen anywhere else. Called Betting Strategies, players can choose from Jumper, Leveler and Booster, all of which alter your bets in various ways to maximise your wins. If you are a Jumper (not the jumping from a rooftop kind), then the game will go up one bet level after every winning round, until it reaches four levels above your base level. So it's a peak-and-trough kind of a strategy that resets after a loss. Meanwhile, Levellers are more risky. After five consecutive losses, your bet level will be raised by two so that you've get a higher payout if you were to win. The Leveller, just like the Booster, resets after you get a win. Yet, we think that the Booster is the most fun out of all the Betting Strategies, because it raises your bet by one level after each loss, until it shoots right up four levels above base line to collect massive potential wins. Whichever strategy you choose to play with, or none, keep in mind that this is a medium variance slot. So although the wins come pretty frequently, we advise that you keep a watchful eye on your wallet and call it quits before you lose more than you can afford. Not only does the game look gorgeous and performs splendidly in terms of audio and graphics, but there are also some blow-out features packaged in too. Triggered by three Safe symbols anywhere on the reels, the extra spins game is launched that's unlike any other extra spins round that we've seen. Every extra spin round, the three brothers drop down and act as wilds that move left with each subsequent spin (Running Wilds), trying to escape. What are they trying to escape, you might wonder? Well, Captain Diaz also appears on the reels, in an attempt to imprison the brothers. When all three are captured, the extra spins round comes to an end. Senorita, Diaz's daughter also appears on the reels during a extra spins round, and tries to help the brothers by releasing any one that's captured (Sliding Wilds). That's nice of her. 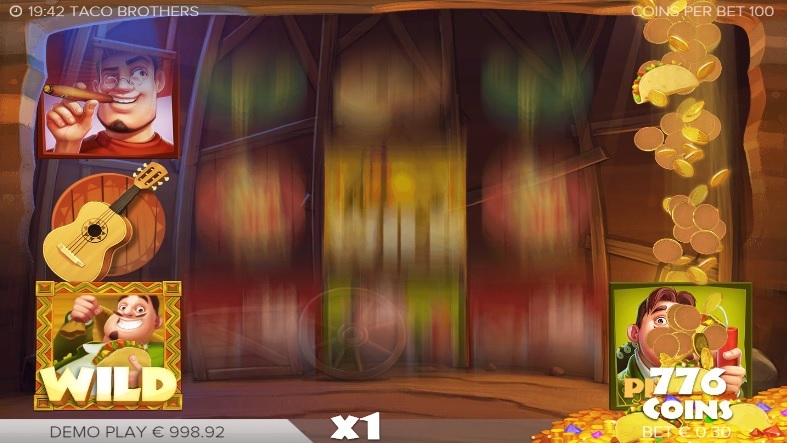 After the feature is finished, your winnings are paid out at a multiplier level (1x, 2x or 3x), depending on which safe randomly explodes at the beginning of your extra spins round. Want to play Taco Brothers? Leo Vegas offers not only 200 extra spins, but also hundreds of pounds in deposit matches. Get on it right now! All in all, Taco Brothers is a a huge success and we've got the brilliant Swedes (Elk Studios) to thank for that. An engaging story line, heck, the presence (!) of a story line is already refreshing, but the graphics and the audio have clearly been thought of and developed extensively, almost to perfection. Other slots have never looked more crisp on a mobile screen too, if you ask us. Nonetheless, we wish that the only real feature wasn't the extra spins. In our humble Mexican peasant opinion, there was much more scope to craft yet another video feature within that engaging storyline. Call it uber picky, but we think it's fair to reward the Taco Brothers with a rating of four out of five. Hopefully the next product that comes out from Elk Studios will be even more action packed than this one. Alright, let's wrap it up already...we are feeling ravenous - tacos tonight, anyone?